Editor of the daily Kaler Kantho Imdadul Haq Milon distributes saplings at a programme organised under ‘Sabuje Sajai Prithibi’, a tree-planting programme, in Bashundhara Cement Mill area at Madanganj in Narayanganj on Thursday. Bashundhara Group, country’s leading business conglomerate, launched ‘Sabuje Sajai Prithibi’ in Banchharampur Upazila of Brahmanbaria on September 3 with the motto of greening the earth. Editor of the daily Kaler Kantho Imdadul Haq Milon said on Thursday that a tree safeguards life and also helps a person become self-reliant in life. He called on people to plant saplings, saying that they will grow into your financial asset in the future. Imdadul Haq Milon was speaking at a sapling distribution programme under ‘Sabuje Sajai Prithibi’, a tree plantation programme, in Bashundhara Cement Mill area at Madanganj in Narayanganj. The country’s leading business conglomerate Bashundhara Group launched ‘Sabuje Sajai Prithibi’ in Banchharampur Upazila of Brahmanbaria with the motto of greening the earth on September 3. A total of 4000 saplings were distributed among 500 families in the afforestation campaign under the Corporate Social Responsibility of Bashundhara Group. The editor of the Kaler Kantho said Bashundhara Group do not believe in publicity but do believe in social welfare and so they do it silently. This sapling distribution programme is an example of such activities. The country’s biggest conglomerate gave Tk 10 lakh to the family of a journalist who was killed in a road accident. It also sent an injured journalist to Thailand for better treatment, he said. Chief Marketing Promotion Officer (cement sector) of Bashundhara Group Md Saiful Islam Helali and an official of social forest division of Dhaka, Mohammad Samsul Hoque, also spoke at the programme. Md Saiful Islam Helali said the government should introduce a tree plantation award at the corporate level in the country. This will encourage many corporate organisations to engage themselves in the tree plantation activities in the country, he added. Mohammad Samsul Hoque said there must have a 25 percent forest cover in a country, but there is only a 17 percent forest cover in Bangladesh. Agriculture Officer of Bandar Thana Golam Mostafa, Officer-in-Charge of Bandar Police Station Akteruzzaman, Deputy Manager (media and information) of Bashundhara Group Mohammad Golam Alomgir were present as special guests. 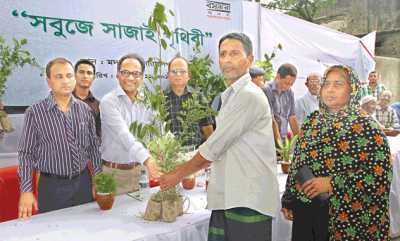 Deputy Managing Director of Bashundhara Cement Sector AKM Mahbubuzzaman presided over the sapling distribution programme.